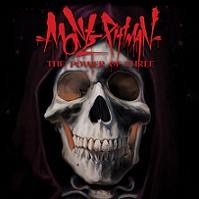 Monte Pittman is a name that you should get yourself acquainted with, if you are not already. Known for being Madonna’s guitarist since 2001 and for his time in the metal band Prong in the 00s, Pittman’s new album is a monumental one. Backed by Kane Ritchotte (drums) and Max Whipple (bass), The Power of Three is his third solo album and latest since 2011’s Pain, Love & Destiny. Featuring some heavy hitting rock music that could topple mountains, The Power of Three is a display of musical excellence. If you are into hard rock and/or metal music, then this is the album to have. This is the type of music that should be getting millions of views on YouTube and topping the charts. Not only is “A Dark Horse” a fine example of the type of heaviness that The Power of Three has to offer, it is also the bar setter as far as the quality of the songs go. It is easily one of the best songs on the album and of the year so far. With a sound that soars above the clouds and a guitar to blow the windows out, “A Dark Horse” is unforgettable. “Delusions of Grandeur” keeps the adrenaline pumping and the walls shaking with its unrelenting hard sound, backed by some killer guitar riffs and drums to go to war with. The instrumental part in the second half of the song is astonishing. The heaviness continues with “Everything’s Undone” while mixing things up with its melodic chorus. “Blood Hungry Thirst” offers some relief from the heaviness of the previous songs, though it is still packed with plenty of energy. It is hard rock at its finest with an explosive finale. “Before the Mourning Son” pulls you in with its captivating opening guitar. The song has a dark and almost menacing atmosphere to it. “End of the World” marks a slight change of pace. It is not as heavy as the rest and it is a song where Pittman’s vocals really shine, displaying a touching emotional vulnerability. Capping off the album is the thirteen and one-half minute epic, “All Is Fair in Love and War.” It is a culmination of all that makes this album so great and it does not feel cluttered because it is spread out over the long run time. It has everything, the smashing guitar, booming drums, and even some death metal growls. It is one hell of a way to go out!